* The above prices are inclusive of electricity and oil. * Deposit of one third with booking. Balance due 6 weeks prior to arrival. * Arrivals from 3.00pm. Departures by 10.00am. The calendar below shows the availability of Gooseberry Barn and also allows you to book online. Bookings will be confirmed ordinarily within 24 hours. Please note, your booking is provisional until confirmed in writing by Gooseberry Farm Cottages. To book Gooseberry Barn by telephone, please call us on 07833 259155 or contact us by email. Please note that when you book accommodation online, you are deemed to have agreed to our terms and conditions. The bathrooms have shaver points and each bedroom has a hairdryer. Oil fired under-floor central heating, electricity and initial supply of logs included. Gooseberry Barn has a selection of DVD's, videos, books, games and tourist information. There is also Sky, wireless internet access and an IPOD docking station. The standard of accommodation: Our accommodation aims to please with lovely lounge with log burner and picture window, both bedrooms with en suite facilities including roll-top bath with shower in one bathroom and walk-in shower in the other. The floors are tiled (so nice and clean) with occasional rugs and of course under-floor heating throughout and the double aspect dining kitchen is very well fitted, with electric hob/oven, washer, dishwasher, microwave and fridge freezer. 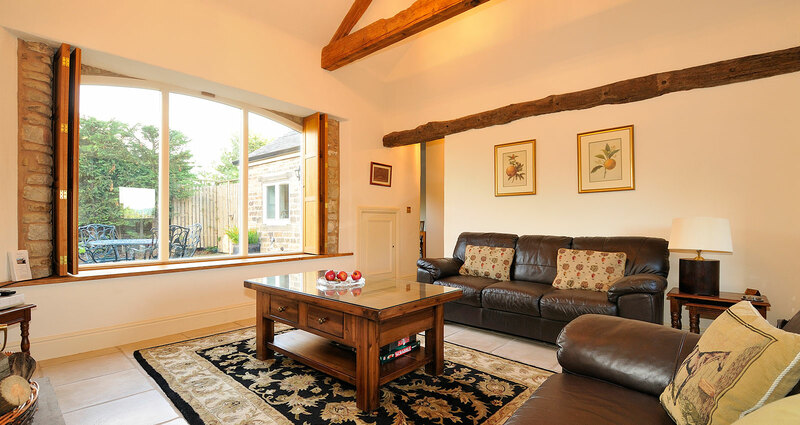 The barn has TVs in the lounge and both bedrooms and has Sky TV. There is WiFi throughout. There is ample parking for at least two vehicles and your entrance has electrically controlled gate access. There are lovely walks from your doorstep and you are able to enjoy walking in the owners 30+ acres with the potential for viewing of all manner of wildlife including badgers, foxes and owls. The Barn has its own courtyard which gets the sun (when around) for most of the day. Additionally, there is a separate seating area if you want to view the surrounding countryside. 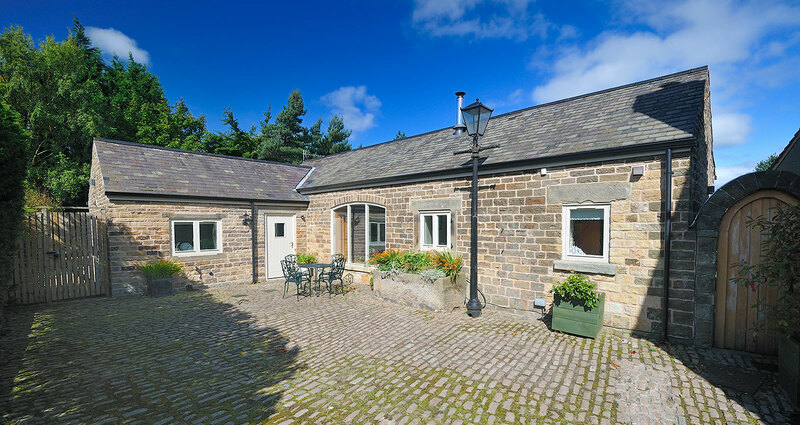 Gooseberry Barn is ideally placed to visit all that the Peak District and Derbyshire has to offer. It is only 4 miles to Chatsworth and from there a short distance to either Bakewell or Matlock. The pretty villages of Baslow, Hathersage, Castleton and Eyam, to name but a few, are all within very easy commuting (no more than 1/2 hr to any of them) as is the market town of Chesterfield and the vibrant city of Sheffield (or even the fantastic shopping at Meadowhall). There are numerous excellent eating establishments within easy commuting of the barn, with the nearest pub serving food being circa 500 metres away. Read our 'Guest Comments' to see what they loved about Gooseberry Barn. We have many guests who come back time and time again because they love the Barn, its location and what it has to offer in terms of the holiday experience. Most of the houses of Holmesfield are situated on the B6054 which is one of the country roads out into Derbyshire (restricted road so lorries not allowed) and the barn is no different. The road is the other side of the stone wall to the courtyard, screened by the stone wall and huge conifers. It can get busy, particularly at weekends as traffic goes out into Derbyshire. It is also quite a 'horsey' area, so you will see quite a few horse riders using the road.